Do you dream of heading out on the highway in a school bus conversion? If you answer, heck yes, you're not alone. Many people have turned their tiny house wanderlust into reality by transforming a used school bus into a comfortable mobile home. From a charming roaming cottage to the first B&B on wheels, we found five of the best school bus houses—so get ready to hit the road—these traveling homes just might inspire you to ditch your rooted dwelling. Alyssa and Will are two outdoor enthusiasts who quit their jobs to transform a 2001 GMC Bluebird transport into a tiny house on wheels called the Outside Found Bus. The entryway is filled with features found in traditional homes like a floor mat to prevent slipping and hooks and baskets for outerwear storage. Notice the driver's seat on the left? It was recovered to match the IKEA FRIHETEN sofa cushions on the right. Smart furniture solutions made the most of the interior's 200 square feet. For instance, the dining table on the left is a wall-mounted drop-leaf that folds down to create extra floor space when needed. Another bright idea is the platform sofa. The seat cushions conceal built-in storage cabinets. Having a fully working kitchen makes life on the road more convenient. That's why the couple outfitted their space with a compact fridge, gas stovetop, countertop oven, and yes sirree, sink with hot and cold running water. What keeps it all powered? Solar energy and propane. There's also a 65-gallon freshwater tank for the tap. The bedroom at the back of the bus is a comfortable nook just big enough for a full-sized memory foam mattress with under bed storage. Outside Found: Wait, There's a Garage?! Alyssa and Will think the coolest spot in their school bus home is the garage—and we agree 100%. It's an ingenious idea that keeps their main living area clutter-free. The couple stores all of their outdoorsy stuff from mountain bikes to climbing gear in the tiny garage. To access just open the emergency door at the rear. Yes, this tiny roaming abode also has a full bathroom. You can see photos of the composting toilet and shower stall on the couple's blog, Outside Found. Head up—After touring the Western United States in their mobile dwelling for nearly two years, Alyssa and Will have decided to settle down. You can buy their school bus house for $54,500. ​Turning an ordinary yellow school bus into a whimsical cottage takes talent, which Mira and Jeremy Von Thompson, the duo behind this school bus renovation have in spades. Mira's a self-taught interior designer with a fondness for storybook whimsy. Jeremy is a master auto body technician who studied woodworking in college. Let's talk a closer look at their lovely creation, a tiny home called Gypsy. Beadboard walls. Custom cabinetry. That adorable yellow fridge (it's a refurbished old Frigidaire). Look at that lovely porthole window! Yes, there's plenty to love in this charming country kitchen. The couple sleeps in this enchanting bedroom-in-a-cabinet that packs eleven storage drawers. Directly above is a loft ​style lounge. The loft space on top of the bedroom nook gets plenty of sunlight. We think it's the perfect spot to curl up with a great read. Just when you think this tiny home couldn't get more picturesque, you find another storybook-inspired window. There's more to see. 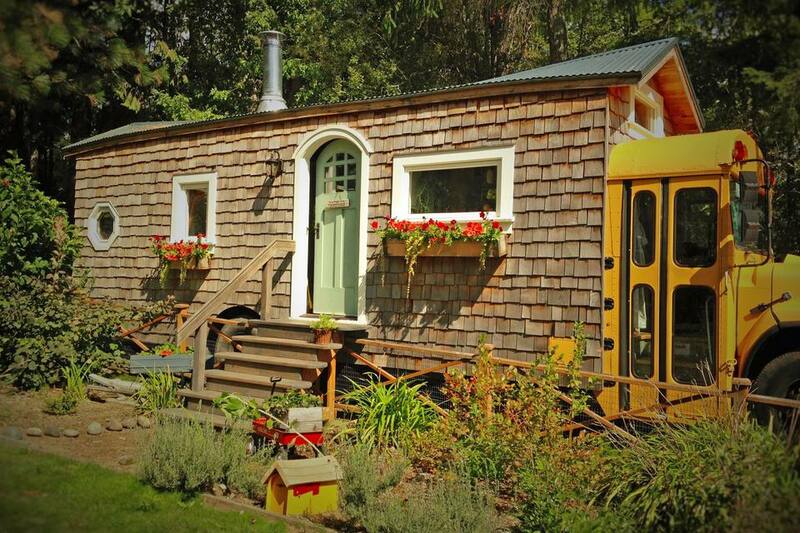 Watch this ​tiny home's two-part tour. To view more photos of the Gypsy School Bus House, visit Von Thompson Creative. Felix Starck and Selima Taibi converted a 1996 Thomas International into a loft styled home on wheels dubbed Expedition Happiness. Their social media fans say it's the coolest tiny house on wheels ever. The main living space features smart, small space staples like a wall-mounted table that folds out of the way and a built-in sofa with concealed storage. Chic accents like the white midcentury-inspired side chair and the IKEA FOTO pendant lamp adds a dash of Scandinavian style. Rustic wood walls and Shaker style cabinetry adds a big dose of retro style. Reclaimed wood walls and industrial-inspired accents like the wall sconce and rail storage is what makes this galley styled kitchen seriously stylish. The compact space is also surprisingly well equipped. There's a real stove with cooktop and oven and a fridge with top freezer that's nearly full-sized. This bedroom is quite spacious for a tiny roaming home. It's also chock-full of practical storage solutions. Above the bed are built-in cabinets. Under the mattress, are pull out drawers. There's more you got to see (like the subway tile bathroom!) Watch the video tour on the Expedition Happiness YouTube Channel — it racked up more than two million views! You can also follow Felix and Selima on Instagram. Julie and Andrew Puckett were juggling multiple jobs to pay the rent on their Atlanta, Georgia apartment. When their landlord slapped them with a 25% increase, they had to downsize into something more affordable stat. So they bought a run-down school bus house for $10,000. Afterward, they spent four months transforming the converted transport into their dream home. Here's what the mobile dwelling looked like before Julie and Andrew worked their DIY magic. This photo proves that colorful décor and fresh paint can turn a sad little space into a pleasant tiny home. The ghastly green walls were painted a room-brightening white. The couple also added a double duty storage sofa that keeps belongings tucked out of sight. We appreciate the IKEA NYMÖ lampshade that adds a pop of cheerful color. While the kitchen was functional, it needed a face-lift. New hardware and fresh paint spruced up the old cabinets. Afterward, the countertop and shelf were stained a room warming shade. The pint-size bedroom is just as comfy and bright as the rest of the dwelling. To view more photos of this charming school bus home, visit House Bus. Val and Tim Boffle are the outdoor aficionados behind The Nomad Bus, a hostel on wheels that travels to scenic, recreational areas across Europe where their guests can ski, cycle, swim, or hike. Road trips include two squares meals per day (breakfast and dinner), and access to shared amenities including a rooftop deck, hammocks, and outdoor movie projector. Wondering how a North American school bus wound up overseas? The Belgium couple had it imported from Tennessee. Here's a glimpse at Europe's first traveling B&B. Inside the bus is a dorm room for guests that sleeps six. The proprietors, Val and Tim bunk with their two-year-old daughter in a separate bedroom. The kitchen has all the usual appliances found in much larger living spaces. So that you know, Val prepares the guest's meals. There's also a welcoming lounge where up to six guests can kick back with their hosts while enjoying a nice bottle of complimentary wine. When this tiny house on wheels is parked, the couple breaks out the rooftop deck and outdoor dining table. There's plenty more to see. This video shares life on the bus. You can also book a trip and view more photos of this school bus house at Let's Be Nomads.